Home Instead Ipswich celebrated its second birthday in style last week with a celebratory gathering at its offices on Ransomes Europark. With many local organisations and charities attending and enjoying some Home Instead personalised cupcakes, the event was a great success. As Home Instead provides at-home care for the elderly, the team also decided to travel across the local community to take their celebrations to the people who make the business possible – their clients! Nearly 40 attendees enjoyed the festivities and fun at the at-home care company’s offices. Guests included caregivers from Home Instead, as well as key figures from the local community and representatives from various relevant organisations. These organisations included: Alzheimer’s Society, Suffolk Deaf Association, Age UK, Working Age Adults with Dementia Service, local sheltered housing facilities and The Hope Trust. The Home Instead team made home visits to their clients to spread the festivities. Home Instead owner Chris Lye and his team distributed over 80 Home Instead cupcakes to the clients they care for across the local community. Home Instead services include companionship services that can involve everything from escorting clients on visits or appointments to simple conversation and good company; home help covering all aspects of day-to-day housework, shopping, meal preparation and household duties; and personal care such as assistance with bathing, dressing, eating and medication prompts. 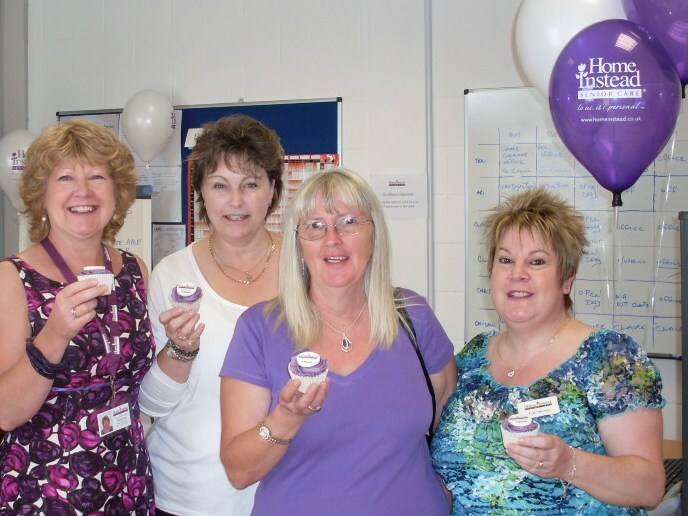 Photo caption: (L-R) Home Instead’s Gill Bishop joins Wendy Chard & Glennys Francis from the Alzheimer’s Society along with care manager Teri Wines about to tuck in to the purple Home Instead cupcakes.